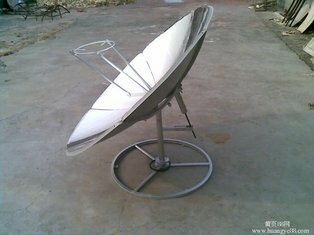 Solar oven adopt unique metal spiral structure adjustment, has the advanced design, compact structure, easy to carry, high thermal efficiency, simple operation, to boil water, steamed, boiled, Fried, Fried, etc all can do it, is very suitable to be used widely at home and abroad. In areas where sunshine is plentiful and conventional fuels are expensive, like the coast or the sierra of Peru, the solar cooker is an ideal complement to a regular stove. It is cheap, easy to use and requires no fuel. The cooker works by concentrating the power of the sun onto a small area in which a pot or other implement is placed. Under strong sunlight, a litre of tap water can be brought to a rolling boil in about 6 minutes. Light weight, convenient disassembly, installation, carry, suitable for long distance transportation. Solar oven using antioxidant reflective film,at least 5 years using! 1.Adopts the high quality carbon steel panel material, will never be deformed, durable; Surface via electrostatic pensu processing, maintenance unnecessary! 2.Compact structure compact, easy installation, easy to operate, beardless maintenance, outdoor all-weather use! 3.The main body of six one-sided board composition, light weight, easy to remove, installation, carry, suitable for long distance transportation. 4.Lower price and, once invest, ten years benefit. 5.Multifunction: the solar cooker suitable for picnic, camping, home cooking, barbecue, boil water, cook rice, stir-fry, steamed dumplings, steamed bread, pan cakes, fried eggs, fried pizza. As a professional solar cooker supplier, we will provide you with customized solution from receiving your first letter! Please do not hesitate to contact us directly, thank you very much!